Please click here for more information about the 3rd Annual Charity Golf Outing being held in honor of Emily Reid O'Connor on Saturday, September 21, 2013. Emily was a Clinical PhD Neuropsychology student at Drexel and PNS Student Representative. Students interested in volunteering at the charity event will get to attend for free. Interested volunteers should email Frank Murray ASAP (frankmurray.ast@verizon.net). anyone else you think may be interested in attending or contributing. 1. describe the functional neuroanatomy of two cortical action systems. 2. identify the key characteristics of ideomotor apraxia. 3. Describe the neuroanatomic substrates of action recognition. 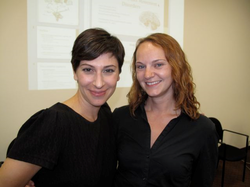 PNS President Jennifer Gallo, Ph.D. with September monthly speaker Laura Brennan, Ph.D.
1. Understanding of the interconnectedness of motor, psychiatric, and cognitive functioning, as well as ultimate impact on everyday functional abilities in Parkinson's disease. 2. Understanding of the presence of apathy in the absence of overt depression, which often occurs in Parkinson's disease and other movement disorders. Implications for treatment, and methods of assessment. 3. Further application to other movement disorders will be illustrated through presentation of a case of progressive supranuclear palsy.